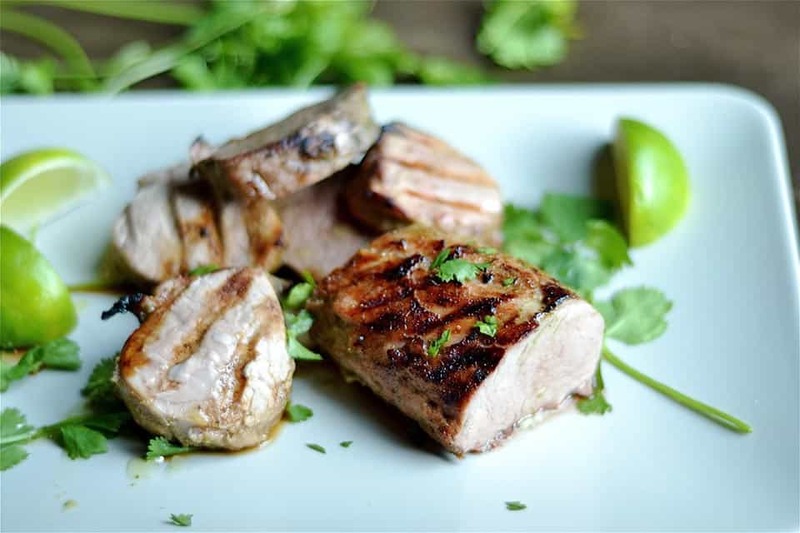 Grilled Cilantro Lime Pork Tenderloin is deliciously marinated, and full of juicy flavor. 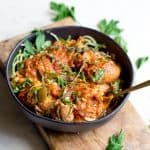 This spring and summer dish is light and perfect for entertaining or feeding the family! 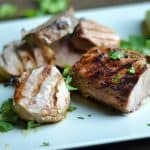 This pork tenderloin really sealed in the marinade I prepared, and tasted absolutely delicious! 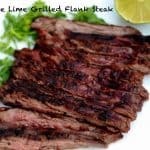 The meat was perfectly tender and juicy, and the lime and cilantro flavors really came through. 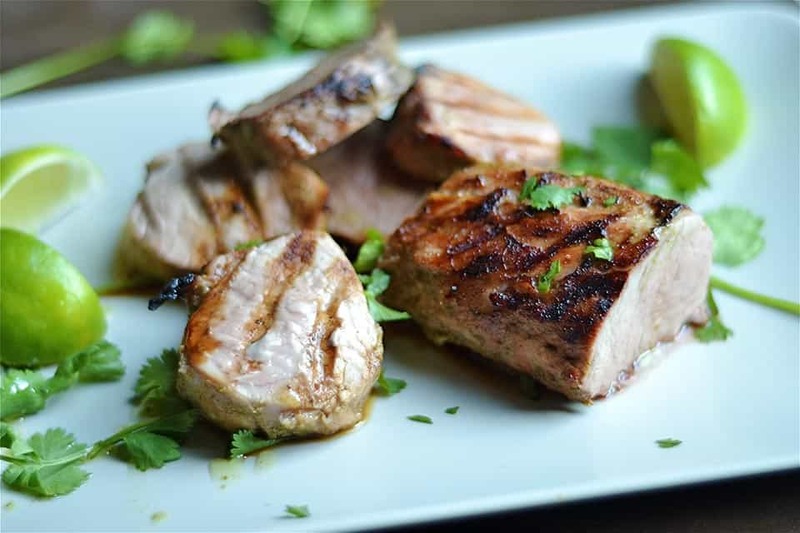 Creating new marinades is a favorite summer activity for me. 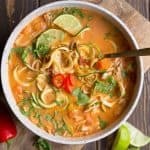 I can whip them up in the morning, or night before, and not have to worry much about dinner for the rest of the day. This one was particularly easy with some staple ingredients: limes, cilantro, olive oil, vinegar, garlic, and cumin. Grilling a pork tenderloin is pretty simple, the only tip my grill master would suggest is to cover the tenderloin while it’s cooking. This helps to seal in the juices and flavors. Also, once you take off the grill, wrap in foil and let it sit for an additional 10 minutes to really get that juicy flavor. 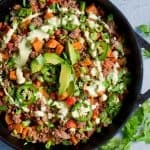 What to serve with this dish? I enjoyed mine over greens with some other vegetables. The flavor of the meat provided enough dressing! 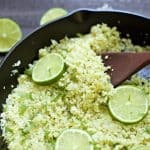 I made my kids a pasta salad, but cilantro rice would also make a perfect compliment! 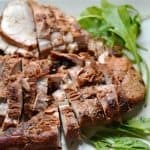 Trim excess fat off pork tenderloin. Place inside a large ziploc bag or airtight container. 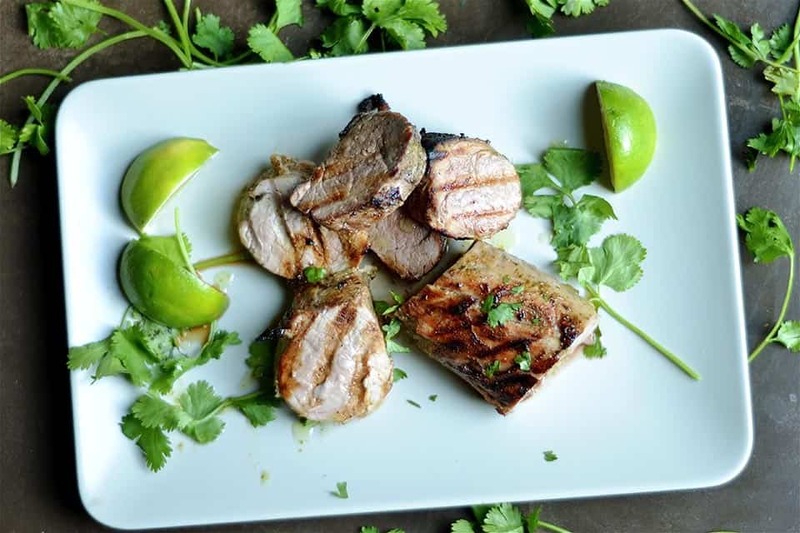 To make the marinade, blend oil, lime, garlic, cilantro, and cumin until smooth. Pour and cover the tenderloin completely. Marinate for 6 to 24 hours. Prepare your grill. If using a gas grill, heat your grill to medium and begin to cook your tenderloin. If using a charcoal grill, do not place the meat directly over the charcoal. Reserve marinade. Cover while cooking, turning avery 2-3 minutes basting with a little more marinade on each turn. The tenderloin is ready when the inside is slightly pink (but cooked), or the internal temperature reaches 140 degrees. Remove from your grill, cover with foil to seal in the juices. Let sit for 10 minutes before slicing and serving. 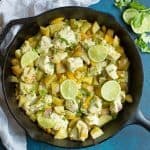 Garnish with extra lime or cilantro. Do you have an approximate time on a charcoal grill? I will check internal temp, but don’t want to poke it a million times. Thank you. It will depend on your fire/flame, but I would say about 12-15 mins total. What kind of vinegar and where in the recipe do we use it? I’m not seeing noted in the directions. Thank you – making this tonight for our Labor Day get together. If I don’t have a grill can I do it in the oven?